Creative Non-Fiction: Broken Shells are Beautiful by Vickie Ray McEntire | LADY. The first time I met you, you told me I was beautiful. I did not acknowledge your statement. I didn’t say thank you. I just gave you a blank stare because I could not accept those words as truth. I was as broken as a plate thrown across the room in anger and smashed into pieces against the wall. I was as broken as the glass in a frame that once protected the image of those now fighting to destroy the symbol it held. I was as broken as shells discarded by the ocean, crushed beneath the runner’s feet, and deemed by none to be worthy of rescue. It didn’t matter to you if my brokenness was obvious or well-hidden under lock and key. It didn’t matter to you how the breaking happened. Only one thing was the object of your attention. You didn’t want to fix me or put a pretty cover over my hurts. You wanted me to see what you saw: a perfectly-created, unconditionally-loved human being. Every time we got together, you seemed excited to see me. Step by step, I began to see how you saw. I didn’t see myself the way you did, but I began to recognize the extraordinary beauty in others. Then your voice began to quiet the noisy repetitive ones that played the same old messages inside my head. While on a recent vacation, I rose early to greet the sun. I walked to the beach to collect seashells as a souvenir of my visit. I saw a flower with blooms I had never seen before. There was a dog jogging happily alongside his runner. There was a woman sitting in meditation, undisturbed by anything happening around her. I noticed a photographer clicking wildly, trying to capture the perfect moment. A man in a business suit with an envelope held tightly under his arm stopped just short of the water's edge, standing confidently before the day that was about to arrive. A surfer climbed back onto his board after each wave knocked him off. Slowly, I came into the picture and out of the background. I looked at the ocean and acknowledged its might. 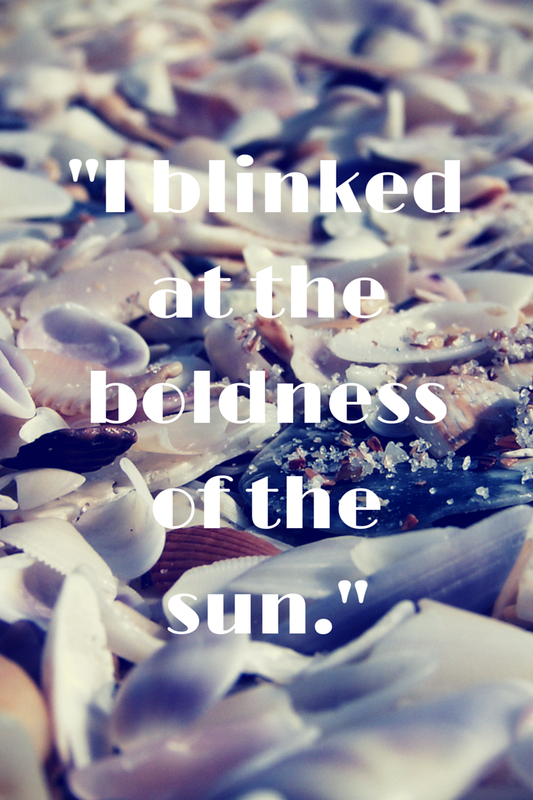 I blinked at the boldness of the sun. I felt small and insignificant in a big world. I reached down with the intention of picking up only the most perfect and beautiful shells I could find, and when I did, I saw how many of them were broken. I thought about the day before when we had toured the forts of St. Augustine and learned they had been constructed of coquina: a rocklike substance composed of broken shells. These forts stood strong against attack. Coquina stone could not be burned, eaten by termites, or penetrated by cannon balls. It absorbed the shock of impact! Coquina rock saved St. Augustine and, 300 years later, these structures stand as symbols of how the course of our nation’s history was set in motion, and held in place, by broken shells. I looked around me, feeling the warmth of the moist morning air. The sand reached as far as I could see on both sides. And, there, an understanding unfolded. Every year, this beach enticed many to stop and relax. To be regenerated. That day, I collected more shells than I had ever before. Each one was carefully selected because it was broken. I now understood the usefulness of their existence, the strength of their brokenness, the sheer joy their fragmented pieces brought to others. Lao Tzu, author of the Tao Te Ching, said, “When I let go of what I am, I become what I might be.” I am a broken shell, and I am beautiful and strong. I believe every chip in my shell can unfold a greater purpose than I can imagine. “When the pupil is ready to learn, a teacher will appear," advises an old Zen Proverb. I am thankful for all that have seen me: not as a broken shell, but as the beautiful person I am, a person with unlimited potential and, most importantly, a future. 2 comments on "Creative Non-Fiction: Broken Shells are Beautiful by Vickie Ray McEntire"